Our History Our production started its work in 1992. Valery began working on his first sketches after receiving the blessing in the Sviatohorsk Lavra. The first works were produced in a small room, by the light of a single lamp, of the tools were a pencil and two knives, a great belief in themselves and God. It has been over 20 years since the first product was manufactured which is still adorns the altar Svyatogorsk Lavra. Since then, hundreds of products were manufactured in different sizes and types, the total area of manufactured goods is equal to the area of 12 tennis courts. Our workshop today These days our workshop is a family business. Father and a son work together in the spirit of Russian ancient religious traditions, they develop projects and designs for each product on their own. They transfer their experience and their faith, put their soul into each product, Valery and Alexander are pleased to introduce you to their work. ZOE PHOS Greek Pectoral Cross 3"
Orthodox Diacon Hand candlestick. Large 15.7"
Orthodox Epitaphios Cover, plashchanitsa, shroud of Christ. 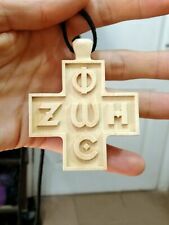 Size 47.2" x 29.5"
Orthodox Carved Wooden Altar Hand Blessing Cross. Medium 6.80"
Orthodox Epitaphios Cover, plashchanitsa, shroud of Christ. Size 55.11" x 35.43"
Orthodox Anointing Brush striuchtsa 3.14"
Orthodox Anointing Brush striuchtsa 3.93"
Orthodox Wooden Carved Icon St George, Middle 8.7"
Orthodox Wooden Carved Icon MOTHER OF GOD of POCHAEV, Middle 8.7"
Orthodox Wooden Carved Icon God Almighty, Large 11.8"
Orthodox Anointing Brush striuchtsa 7.66"
Orthodox Wooden Carved Icon Archangel Michael, Middle 8.7"
Orthodox Anointing Brush striuchtsa 8.27"